Last night I spent two hours, non-stop, listening to music. That by itself isn't special or unique as I spend a lot of time listening to music. What was different is that during those two hours I never left my listening chair and I didn't choose a single track. My attention was held hostage by Sony's SenseMe™ advanced shuffle feature on the Sony HAP-Z1ES. When I reviewed my first Sony device that had SensMe™ installed, I was not excited by Sony's advanced shuffle feature because it didn't seem to be all that novel. It appeared to be just another shuffle. But my first impression was wrong - SenseMe™ is not merely a shuffle which plays a track and then moves X number of tracks forward or backwards to play a subsequent track. SenseMe™ has twelve distinct "channels." The twelve channels or categories - morning, daytime, evening, midnight, energetic, relax, upbeat, mellow, lounge, emotional, dance, and extreme were created by mapping music to a dual axis map based on the mood and tempo of music tracks. The mood and tempo are determined by software which analyzes each music track and computes the relevant track information. 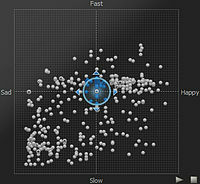 Analyzed tracks are then plotted onto the dual axis map. "The horizontal axis is based on mood and the vertical axis is based on tempo." according to Wikipedia. SenseMe™ has been around for a while. It was first introduced by Sony in 2009, and has been available on Sony's PlayStation 3 and many Sony handsets since 2010. Its implementation on the Sony HAP-Z1ES was my own first exposure to this "better" shuffle methodology and the more I've used SensMe™ the more I've appreciated its ability to string together selections that worked amazingly well together. I would never think of playing Steve Earl's "Loretta" right after listening to the Boulder Philharmonic's performance of "Olvidala," or Ry Cooder's "Crazy About an Automobile" followed by Doc and Merle Watson playing "Take Me Out to the Ballgame," but I enjoyed not only the selections themselves but the way SensMe™ juxtaposes one after another, like a DJ who knows your collection better than you do...what will "he" play next? Surprise! It's all good. Except for the "Dance" and "Extreme" categories, which have less than 100 tracks (I guess I'm not that sort of listener), most of the SensMe™ categories in my HAP-Z1ES music library include several thousand tracks to select from. "Relax" has the most with 5181 possible selections while "Night" has 4172 tracks. Not everything in my music library was categorizable - 4467 tracks came up as unregistered. One more great thing about SenseMe™ - my wife likes it. In the past it's been hard to put on music that we both enjoyed equally - she prefers listening to the same fifteen or twenty well known albums which usually bore me to death. A standard shuffle mode was an uncomfortable compromise since it seemed like every third cut needed to be skipped over because it was not to our mutual liking. But SenseMe™ has brought domestic harmony - interesting selections for me and music with a similar mood for her. That's better than marriage counseling! The only unfortunate aspect of SenseMe™ is that it is only available as part of a hardware package and not as a software app that could be used with any device on any music library. I'd love to have the option of employing SensMe™ anytime, with any playback device, such as an Astell&Kern or Questyle player, but so far SensMe™ is available only on Sony devices. But it doesn't have to be this way. 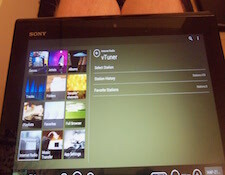 On the Sony site there is a download of the SensMe™ app for certain models of Sony car stereos. Why not a universal version? Make an IOS and Android version, sell it for $3.99 via the App and Play stores. Come on Sony, get with it. Make SensMe™ a stand-alone universal app, Puhleeze?